Winners of Abu Dhabi 3×3 Challenger, Team Al Wahda (UAE) will battle for one of the two qualifying spots for the FIBA 3×3 World Tour Final, that will take place on 15 and 16 of August in Abu Dhabi. Both finalists from Manila will book their tickets for Abu Dhabi, and the competition will be keen, as top teams from all over the world will be part of the tournament. Reigning champions and the top seed, team Al Wahda will face Indonesian side Medan in Pool A and an intriguing Chinese squad from Longshi which features four professional CBA (Chinese Basketball Association) players. The squad featuring the number one 3×3 player in the Philippines, Terrence Romeo, and fellow PBA (Philippines Basketball Association) players KG Canaleta, Rey Guevarra and John Aldrech Ramos will start the competition in Pool D with the familiar faces of Auckland (NZL) and Manila South (PHI). an favourites Manila North (PHI) starring Calvin ‘The Beast’ Abueva will have a hard task to qualify in Pool B with 2013 FIBA 3×3 World Tour winners and Novi Sad Al Wahda old rivals Team Ljubljana (SLO) and Team Beirut (LIB), who reached the quarter-finals of the Tokyo Masters in 2012 and Beijing Masters last season. Last year’s Manila finalists Team Doha are back in the Philippines (in Pool C), with their iconic leader Yaseen Musa and three new additions including former NBA second-round pick Tanguy Alban. Team Kobe left the Manila Masters early last year (losing against Doha!) after coming to the event with just three players and return to the competition with a strong squad, featuring the spectacular pair of Devaughn Washington and Nyika Williams. Also in the pool, a young (21-year-old average) Kaohsiung team from Chinese Taipei. 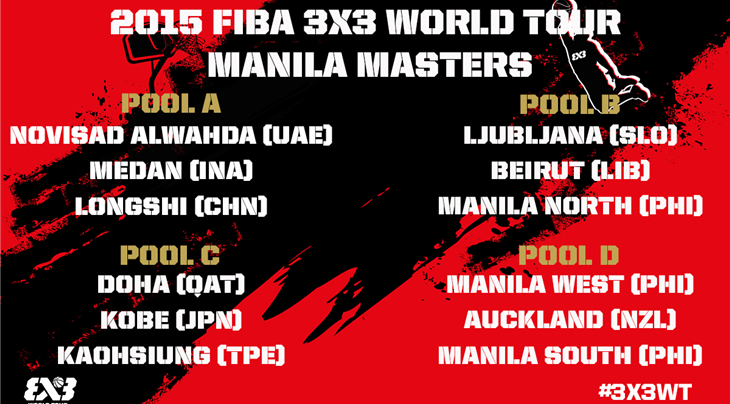 Pool games will start at 14.10 local time (GMT+8) on Saturday live on FIBA 3×3’s official YouTube channel. The top-two placed teams from each pool advance to a standard knock-out round which starts at the quarter-finals stage, from 13.45 local time on Sunday. FIBA 3×3 World Tour FINAL will take place on 15-16 October, in Abu Dhabi. The tournament is organized by Abu Dhabi Sports Council together with its partners, Extra International Sport and Sport Arena.